If your icemaker starts acting up, either producing no ice or small ice, this could be as a result of poor water supply. 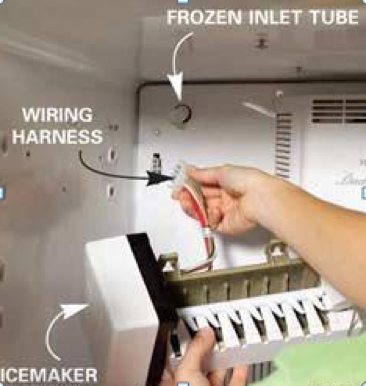 Three common problem areas are a frozen inlet tube on the icemaker. Ice maker DIY Fix 1. Top Freeze icemakers are usually very easy to remove. The inlet spout is can be seen towards the rear of the freezer compartment. Check for ice blockage and debris. Check the water supply from the wall. Check for kinks especially in copper water line. Where the water line is tapping into a water supply either under the sink of down in the basement where the water line may lead to. Saddle valves can clog over time. Shut off the water supply and remove and clean or better, replace the valve. All water and ice dispensing refrigerators have water valves which control the supply of water to the icemaker and/or dispenser. They are electrically operated and can fail. On more complicated units, there are multiple valves so it can be tricky to identify the correct assembly. These valves are normally 115V mains so BE CAREFUL. Water and electricity can be deadly.